Want to go on an easy hike in Norwalk, Connecticut? I recommend you visit Cranbury Park. If you like tough hikes then this might be way too easy for you. Also, you can get married here, have a picnic, go mountain biking, and exercise with your dog. Ok, technically you don’t get married on the trails, but you can rent the mansion located on the premises. Gallaher Mansion is the first thing that you see when you drive into Cranbury Park. It was originally built in 1929 and is now a museum. Unfortunately, as of this post, their website is just a static photo. Therefore, I couldn’t obtain any information on the museum’s time and cost. On the latest Sunday that I went on a walk there, there was an event going on by the playground that was full of kids, parents and loud music. You can rent the mansion for all sorts of event, but weddings are popular at the location. I’ve never walked into the mansion, but on several occasions I’ve gone just to sit down on the huge lawn and read a book. If you’re not up for taking a walk, you can always just have a picnic. Hopefully, they continue updating the website and provide more information in the near future. *Tip* If you are a Norwalk, CT resident with a beach/resident pass then there is no parking fee to enter Cranbury Park. Other CT residents pay $5.00 and out-of-state residents pay more. During the fall and winter, parking permits are not enforced. I usually start on the ADA trail/blue trail (see map here) and do a complete loop. This past weekend I hit the trail here as a warm-up before going on a bike ride at another location. I truly consider the trails more of “a walk” instead of “a hike” because there is no significant elevation. It’s also just a little over a mile long. 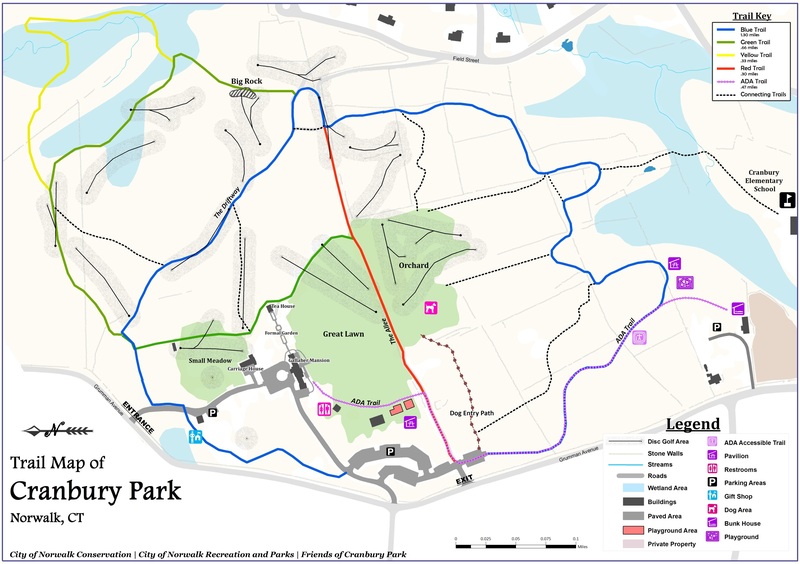 This is why you will also see a lot of families with their kiddos in Cranbury Park, and why you will see a lot of children on their bikes throughout the trails. The blue trail will eventually lead you to the red trail. Here you will mostly see pups and their human parents. On this particular Sunday we continued onto the green trail, and that is when you’ll start to see the disc golf baskets. I went in early October, but in peak fall foliage this would make for a great view. There will be people in groups, maybe with a beer or two in hand, throwing discs. I haven’t tried it yet, but there are 18 golf baskets along the route. You will also see some information about the plants throughout the trail. It’s a pretty short and serene hike, and I would recommend it for people in the area that don’t want to exert themselves too much. Cranbury Park has a playground, a mansion, lots of green space to throw a frisbee or two, and a lawn to have a picnic at. So head out to Norwalk, Connecticut on a clear day just to chill and relax. I always envisioned Connecticut to be full of cute little houses and big backyards, I never realized it had so much nature! Such gorgeous photos! I will have to add this park to my bucket list! Connecticut is such an amazing state. I would love to walk through this park, it looks so relaxing! Looks like a lovely place for a stroll. It is so green and lush. Waiting for the leaves to turn color! I like exploring new trails. The trails in Cranbury park look amazing. Will definitely come here. Thanks for sharing. Fall in the US is the best and hiking is the perfect thing to do. Love your idea about getting married there. My friend’s fiance proposed on a hiking trail so it’s possible on the trail! Cranbury Park looks amazing for hiking! I also liked the architecture of the Gallaher Mansion! It sounds like a great setup for wedding photoshoot! Yes, a lot of people have their weddings here. Or some just have fall shoots! Nice post! You definitely don’t have to work hard to enjoy the outdoors. If you know where to go, you’re right! Nature is so beautiful especially during the fall when you see the leaves changing. Beautiful pictures! Thanks for sharing! I love fall in CT. Being from NJ it is a short trip when you know how to beat the traffic and travel smart! I will have to add this as a place to visit! True! That is definitely how I feel about traveling in the try-state area in general. I say “I DO” to the hike….not so much the wedding 🙂 Seems like an ideal location to clear one’s mind and reconnect with nature. Hahaha! I see what you did there. Yes, but you can always rent the place for other events. I’m sure it is beautiful there this time of year! I think it would be worth checking out the mansion too. I’m sure it has some amazing views! Yes! Hoping maybe I’ll have the opportunity to go inside one day. Amazing the small side trips that are uncovered from the BIG tourist destinations. Thanks for sharing a now unhidden part of the world that most would never see. Your post encourages me to visit my local area in which I always overlook. When I lived in the outlying suburbs of Seattle I overlooked the tourist trappings and side trips that make up the character of a city. Only until moving away did I take the time to revisit the hidden and visible sites of interest. That’s so funny about Seattle! I think this happens a lot because we want to “avoid” doing what the tourists do. My cousin has lived in NYC her whole life and she went to Ellis Island for the first time with me a couple of years ago. Baffling! This seems like such a beautiful place to get outside and enjoy some fresh air. Plus your photos are gorgeous! Thanks so much, Brianne! I took some but my husband usually takes them for me. What a beautiful park to spend some time in. I love that there is some history to learn, plus the landscape itself looks so relaxing and beautiful. Enjoying your photos! Wow. Your photography is awesome. So cool and green. Looks like you had a great time. This is something I would love to do in Connecticut! I have never been to the state, but this exactly the type of local knowledge that I would hope to have when visiting the state! Hope you have the opportunity to visit one day! This is such a beautiful park!!! I love looking at plants but I hate it when I never know what the names are so it’s awesome that they’ve labeled them. Would defs love to do a picnic here too! Connecticut is such a beautiful state. Nice to know about the facilities and hiking available at this park. Beautiful trail! I’ve always wanted to visit the area, especially this time of year. Such a beautiful place! That mansion looks huge. I love walking around in this kind of places. Being close to nature and breathing the air in a forest just makes my day. Same here! That’s why I love to go out and hike! Connecticut is so beautiful for fall leaves and especially for hiking! It looks like am easy pleasant hike. There is plenty to do in Cranbury park between Frisbee golf and exploring the mansion. Even if it’s an easy hike, I’d love to do it for the entire stretch is dotted with trees and flora. I’d incorporate this one on my visit to Connecticut for sure! Thanks for the suggestions and wonderful pictures. Thanks so much, Harsh! It seems like you like to be challenged! great post. I live a town over and have never hiked here! Will give it a whirl! We’ve got some pretty trails like that in Richmond, VA. Aren’t they the best way to spend a weekend morning? Loved your write-up and the things to keep in mind (like the spot where the blue blaze is barely showing). Info like that is so helpful! I live near CT for years, but never thought to do anything there. What a lovely place Cranbury park is.